A showdown is looming between the Nelson Chamisa-led MDC and the Zimbabwe Republic Police (ZRP) after the youth wing of the country's biggest opposition political party resolved to conduct massive protests against government without first notifying the police. The notorious Public Order and Security Act (Posa) makes it a requirement for the ZRP to be notified by parties that wish to stage protests or public gatherings. It also gives police unfettered powers to suspend public gatherings. But in a landmark ruling in October last year, the Constitutional Court (Con-Court) ruled in October last year that the provision empowering the local police to indefinitely ban public demonstrations in their jurisdictions was unconstitutional. As a result, the MDC is planning to embark on demonstrations to push President Emmerson Mnangagwa's administration to deal with the bad economic situation, which is threatening to grind the country to a halt, while bypassing the police. Secretary-general of the MDC Youth Assembly Lovemore Chinoputsa told the Daily News yesterday that they will start rolling out the demonstrations next week. "This year, we are not seeking police clearance because it's our time to liberate ourselves. We cannot leave out liberation to a group of people that are captured and that also need to be liberated from the jaws of Zanu-PF. In our end of year youth national council, we resolved to embark on a series of demonstrations to force Zanu-PF out because they have failed to run the affairs of the State," Chinoputsa said. Efforts to get a comment from the police could not yield results yesterday after ZRP spokesperson Charity Charamba said she was in a meeting. The MDC has insisted that it is their democratic right in terms of the Constitution to stage demonstrations. The party's leader, Chamisa has refused to recognise Mnangagwa as the legitimate president of the Republic despite a Con-Court ruling last year to the contrary. 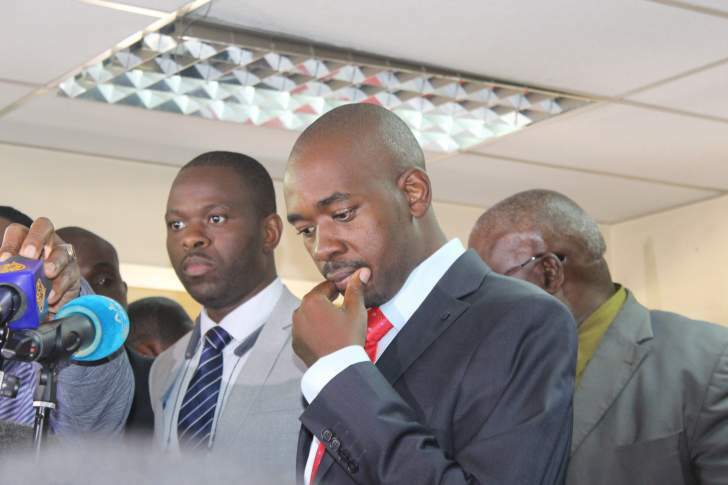 The Con-Court ruling came after Chamisa had challenged the results of the elections. Mnangagwa rose to power in 2017 following a de facto military coup that toppled long time ruler Robert Mugabe and subsequently won the July 30 elections after he garnered 50, 6 percent of the vote against Chamisa's 44, 3 percent. Since his inauguration, things have been going west, with cash and foreign currency shortages worsening, while fuel shortages and price increases have become the order of the day. "We have an absent leadership in this country and the same spirit that drove thousands into the liberation struggle is the same spirit that's driving us. We shall be our own liberators," Chinoputsa said. He added, "Mnangagwa has had ample time to revamp the economy of this country but he has shown that he has no capacity. Worse is the fact that he surrounds himself with people that know nothing about statecraft, but the gun only. So it will be an indictment on our part as young people if we sit back and allow these old men to destroy our future. So by mid-January we will be calling for our first demonstrations which will culminate in actions all over the country". With each day passing, government seems to be running out of solutions to deal with the economic challenges, at a time the general populace is getting frustrated by the situation. Amid these trials and tribulations, the doctors have downed their tools for over a month, while teachers have also resolved to follow suit. Teachers' unions and nurses issued a joint statement last week after a meeting in which they resolved to down their tools, until government concedes to their demand to pay them in United States dollars (USDs). The meeting was attended by the Zimbabwe Teachers Association (Zimta); the Progressive Teachers Union of Zimbabwe; the Teachers Union of Zimbabwe; the Amalgamated Rural Teachers' Union of Zimbabwe; the Zimbabwe Rural Teachers Union and the Zimbabwe Democratic Teachers Union. Zimta said it is worried by the government's failure to address any of these grievances and concerns despite previous engagements and discussion. "Now therefore, given the foregoing, it is thus declared as follows: a) Our members are unable to report for duty with effect from the 8th of January 2019 due to incapacitation, b) to enable the teachers to report for work and to subsist, we demand payment of salaries in USDs," the association said in a statement issued recently.